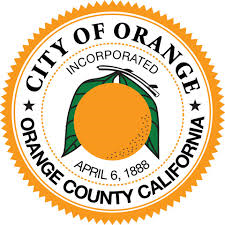 The City of Orange, located in Orange County, California, is approximately 3 miles north of the Santa Ana. Orange is unusual in that many of the homes in its Old Towne District were built prior to 1920. While many other cities in the re­gion demol­ished such houses in the 1960s, Orange decided to preserve them. The population was 136,891 as of 2014. Orange enjoys a diverse economic portfolio that offers a number of business advantages. Old Towne, Orange Historic District, a one square-mile around the original plaza, contains many of the original structures built in the period after the city’s incorporation. It is a vibrant commercial district, containing Orange County’s oldest operating bank and the oldest operating soda fountain. The Historic District was listed on the National Register of Historic Places in 1997, and is the largest National Register District in California. The Old Towne Preservation Asso­ciation is a non-profit organization dedicated to maintaining the district. Orange is unique among the region and the state in that it has the second largest concentration of historic buildings. The City of Orange staff has successfully utilized Progressive Solutions’® LicenseTrack,™ business licensing application since June of 2009. They now also host PSI Web Renewals and PSI’s PaymentCentral program. Their prior HTE system was outdated and inflexible. The sheer number of tax payers made it desirable to streamline management of this tax function and simultaneously reduce staffing requirements. After reviewing PSI’s system and reviewing over a decade of the highest ratings by independent surveys, city staff was convinced that Progressive Solutions’® LicenseTrack,™ PaymentCentral, and Revenue Recovery was the obvious choice. The City of Orange is very proactive in discovering unlisted businesses and bringing them into compliance with licensing requirements. Progressive Solutions® facilitates their needs by supplying various comparison, importing, letters, and followup tools within our system software. Progressive Solutions® has also created many custom reports and form letters to facilitate their licensing process. LicenseTrack,™ the business licensing system from Progressive Solutions® has enabled the city to obtain answers and make operating changes without programming or additional cost. Most upgrades and minimal report cus­tomizations are included in the annual support fee so that ad hoc requirements do not typically require additional midyear budgeting. Their Web Renewals, Web Applications and automated Revenue Enhancement rounded out the ensemble, bringing Fresno into the 21st century!